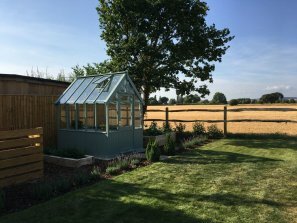 So far, this year there has been many memorable buildings designed and hand-built at our Norfolk factory and subsequently installed in the gardens of happy customers. With so many stunning installations this year already, we were hard pushed to find our favourites….. This building was placed in Berkshire in July and is a great asset to the customer’s vegetable patch. Two automatic opening roof vents will help with temperature control and it has been painted in the colour of Sage, which fits in with the landscape nicely. The colour was selected from our range of Valtti paint colours that we offer. It is a useful building for planting and is well adapted to give your gardening a helping hand. The Greenhouse has served the customer well already and we hope will continue to do so for a long time. Set in a beautiful garden, this Blakeney Summerhouse is slightly different to our standard design because of its summerhouse doors and windows instead of the usual chalet style. Polished brass door furniture has been chosen to enhance the classic look. This is a lovely addition to our customer’s garden in Twickenham, and we can only imagine how relaxing it must be to while away the evening hours in a deckchair with the doors pinned open. One of our Cley Summerhouses was placed in an exquisite surrounding, right next to an outdoor pool. 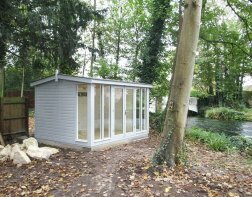 This summerhouse, which was delivered in Oxfordshire in July and could be used for many different purposes, for example, a changing room or a store for inflatables and barbecue equipment. The customer has picked Georgian windows over leaded and has chosen the paint colour Twine, again from our Valtti paint range. 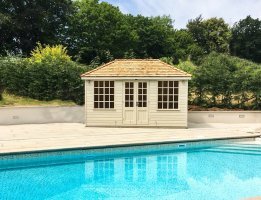 After swimming in the pool, the Summerhouse could provide the perfect place to dry off and relax. Our Cley completes this garden perfectly, and we are sure the customer will enjoy many balmy summer days spent in and around it. At the start of this year this Burnham Studio was ordered for this Hampshire garden and is located next to a flowing river, where our fitting team took this beautiful photograph. This Studio would be brilliant as an art studio with its inspiring surroundings offering a wealth of ideas. It is also the perfect photographer’s creative space, with an abundance of natural light and plenty of space. This customer also opted to add several extra features such as the painted interior and natural lacquer on the floor, which enhances the look even more. 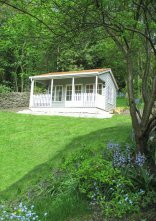 This grand Pavilion Garden Room was installed in Derbyshire in April this year and is at the edge of a peaceful, verdant garden. The veranda is a lovely place to sit outside and admire the pleasant surroundings, especially from the high location where it is nicely perched. By having an electrical pack with a heater, as well as being fully insulated and lined with double glazing, this building is fully suited to year-round use. Whether it’s sun bathing in the summer or cosying-up in the winter this Garden room can be used and loved throughout the seasons. Pebble and Ivory is the colour combination this customer chose, along with cedar shingle roof tiles, which gives a neutral colour scheme, perfect among colourful surroundings. The range of summerhouses, the Studio and the Greenhouse above shows the best of our buildings. This shows the options, extra features and types of buildings that we sell. We are looking forward to more of these lovely buildings being installed throughout the rest of the year. If you like what you have seen please look at our products and contact us if you have any questions for our expert sales team.